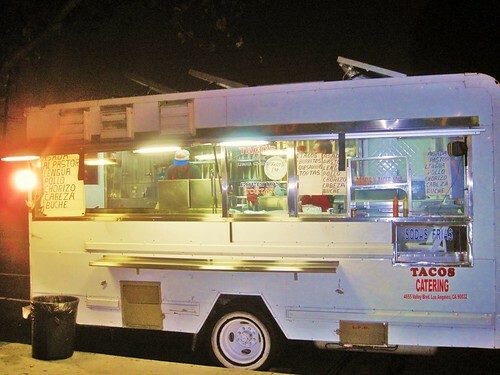 Last Tuesday night on Eagle Rock Blvd it was Kogi and Leo’s taco truck pulling in the crowds. Kogi the phenom and Leo the old dog, the favorite taco truck of Oxy students who simply refer to it as “taco truck“. And south of these wagons parked a lonely taco truck with not even a soul in sight, Tacos El Sabrosito. This was my truck. This is where I was going to eat. On this night I was more curious than I was hungry. But the locals are set in their ways. If they want the more classic LA tacos of meat, chile salsa, onions and cilantro they will go to Rambo’s. If it’s the more savory, sloppy, guacamole on your fingers taco then it’s Leo’s or Sonia’s. My truck is shiny and clean with no artwork just a small sign “Tacos El Sabrosito” Two squirt bottles of salsa sit next to the ordering window, a small color tv blares a Mexican gameshow, an eager taquero takes my order. I order Al pastor, asada, and lengua . The taquero repeats the order to the older hombre on the grill who looks me over. Yeah I’m a taco reporter from the Westside. The asada is a classic LA taco- finely cut beef thats greasy and flavorful topped with onions, cilantro and the excellent salsa roja. The lengua is soft and not at all gamey and with the shot of lime and salsa roja it’s excellent . It’s the al pastor that disappoints , the pork is ground and crumbly and flavorless. But two out three is good enough. Most importantly these tacos were greasy and hot and the salsa roja flavorful and spicy. The cucumbers and radishes are a nice compliment and at $1 a taco it’s hard not to like what El Sabrosito is doing here. At any other location El Sabrosito would do ok but here on Eagle Rock Blvd the locals have spoken. It’s Leo’s, Sonia’s and Rambo’s. And on nights when Kogi comes to town the trucks looking on the outside are in for a lonely night.